The City of Cupertino has created a 5 minute community survey to solicit local citizen feedback for the proposed Carmen Road Bridge project. Click here to voice your support for an off-street walking and biking connector across Stevens Creek Boulevard: https://www.opentownhall.com/6958. More information is below, but please take the time to fill out the survey, as that will drive the city’s plans. Into the early 1970’s, Carmen Road intersected with Stevens Creek Boulevard (SCB) until the road was sculpted down to reduce the grade. One can see that the Carmen Road approaches are still intact – SCB is just 20′ or so lower than it was “back in the day”. This project is visualized as a bike/ped bridge like you would see in a park, or other natural areas, thus keeping the project costs reasonable. A part of the city’s Bicycle Boulevard system for Monta Vista, the bridge would connect two neighborhoods that are separated by the very busy SCB and make it easier for residents to access Varian Park and/or Blackberry Farms. The very busy SCB additionally serves as a barrier for students to access Stevens Creek School, Kennedy Middle and Monta Vista High by bike or walking. There are an estimated 100+ students from the Janice/Scenic neighborhood who attend Stevens Creek School. Conversely, there are over 350 Kennedy Middle and Monta Vista High students who commute from the SCS neighborhood each day. The result is more traffic and congestion around our schools. 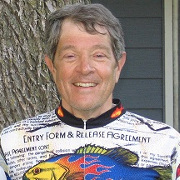 Please see this link on our Walk-Bike Cupertino website for information on student counts, pictures and summary information. Thank you for your time and valuable input! The City of Cupertino invites you to share your thoughts on the creation of a new pedestrian and bicycle bridge across Stevens Creek Boulevard at Carmen Road. The Carmen Road Pedestrian/Bicycle Bridge, identified as a priority project in the 2016 Cupertino Bicycle Transportation Plan, is a grade-separated structure envisioned to provide a vital connection for pedestrians and bicyclists for the neighborhoods north and south of Stevens Creek Blvd between Foothill Boulevard and Phar Lap Drive. 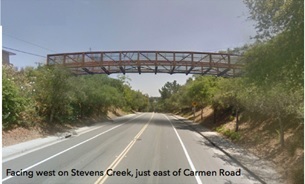 The bridge, which would continue the existing alignment of Carmen Road across Stevens Creek Boulevard, would allow easy and safe access to and from residences, schools, parks and recreation centers, as well as create a Safe Routes to School gateway for Stevens Creek Elementary School. Please take this brief survey to tell us your ideas, comments, and questions about this possible crossing. Responses will be accepted until Monday, January 28, 2019. All feedback will be taken into consideration for this feasibility study. rmen Road across Stevens Creek Boulevard, would allow easy and safe access to and from residences, schools, parks and recreation centers, as well as create a Safe Routes to School gateway for Stevens Creek Elementary School. Please take this brief survey to tell us your ideas, comments, and questions about this possible crossing. Responses will be accepted until Monday, January 28, 2019. All feedback will be taken into consideration for this feasibility study. Take the survey at https://www.opentownhall.com/6958.